About once a month or so, I find myself over at the local post office mailing packages. I’m selling something on eBay or shipping a gift to a relative or trading something by mail. Whatever it is, I usually finish my visit to the post office by taking a long look at the bulletin board. At my local post office (and at pretty much every smaller post office I’ve ever visited), the bulletin board is a crazy medley of local event announcements, items for sale, people looking for a group, and countless other things. It’s like a small town version of Craigslist, except with more variety and chaos. To give you an idea of the value of doing this, here are some of the things I’ve found on that bulletin board over the last several months. I found a “moving to another country” sale, where the people were trying to sell the vast majority of their belongings. I wound up buying three or four items from them at a pittance. I found an announcement about a free concert that was quite enjoyable. The event included a silent auction and several raffles for charity, where my wife ended up bidding on (and winning) some very discounted tickets for our family at the local zoo. I found an announcement of a local book club that was starting up. I actually tried to join this, but the schedule of the club wound up conflicting with my own schedule too much. In addition, I found about a dozen yard and garage sale announcements, a notice about an upcoming community festival, and a youth club in the area that’s looking for new members. These were just the things I was interested in. There were vehicles and other items for sale, an announcement of a big party for someone I didn’t know, and tons of announcements of carnivals and other such community events. Not only is this a useful resource for finding things, it can also be useful to post things as well. Want to privately sell a vehicle? Wanting to form a book club or host some other local event? Wanting to start a community group? 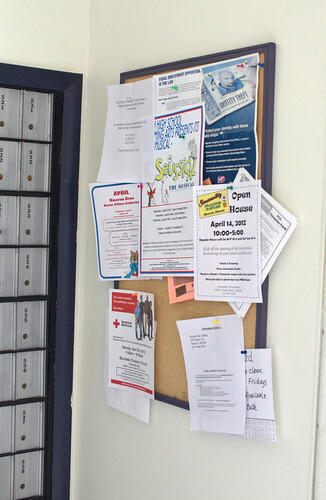 Your post office bulletin board is probably a good place to start. The next time you’re in your local post office mailing a package or picking up some stamps, spend a moment to look at the bulletin board that might be posted in there. You might just find a thing or two of real value to you.